I. INTRODUCTION. The cerebral cortex, the thin, gray covering of both hemispheres of the brain, has two types: the neocortex (90%) and the allocortex (10%). Motor cortex is the thickest (4.5 mm); visual cortex is the thinest (1.5 mm). II. THE SIX-LAYERED NEOCORTEX. Layers 11 and IV of the neocortex are mainly afferent (i.e., receiving). Layers V and VI are mainly efferent (i.e., sending). A. Layer I is the molecular layer. B. Layer II is the external granular layer. C. Layer III is the external pyramidal layer. It gives rise to association and commissural fibers and is the major source of corticocortical fibers. D. Layer IV is the internal granular layer. It receives thalamocortical fibers from the thalamic nuclei of the ventral tier (i.e., ventral posterolateral and ventral posteromedial). 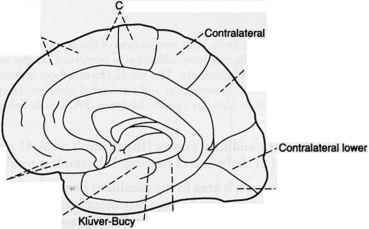 In the visual cortex (Brodmann's area 17), layer IV receives input from the lateral geniculate body. E. Layer V is the internal pyramidal layer. It gives rise to corticobulbar, corticospinal, and corticostriatal fibers. It contains the giant pyramidal cells of Betz, which are found only in the motor cortex (Brodmann's area 4). F. Layer VI is the multiform layer. It is the major source of corticothalamic fibers. It gives rise to projection, commissural, and association fibers. 1. The motor cortex (Brodmann's area 4) and premotor cortex (Brodmann's area 6) are somatotopically organized (Figure 23-2). 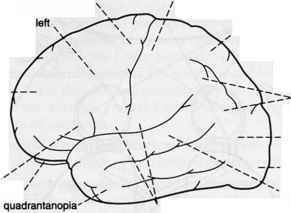 Destruction of these areas of the frontal lobe causes contralateral spastic paresis. Contralateral pronator drift is associated with frontal lobe lesions of the corticospinal tract. 2. Frontal eye field (Brodmann's area 8). Destruction causes deviation of the eyes to the ipsilateral side. 3. Br oca's speech area (Brodmann's areas 44 and 45) is located in the posterior parr of the inferior frontal gyrus in the dominant hemisphere (Figure 23-3). Destruction results in expressive, nonfluent aphasia (Broca's aphasia). The patient understands both written and spoken language, but cannot articulate speech or write normally. Broca's aphasia is usually associated with contralateral facial and arm weakness because of the involvement of the motor strip. Figure 23-1. Some motor and sensory areas of the cerebral cortex. (A) Lateral convex surface of the hemisphere. (B) Medial surface of the hemisphere. 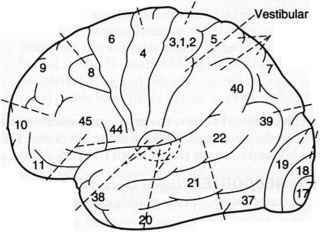 The numbers refer to the Brodmann brain map (Brodmanns areas). rior two-thirds of the frontal lobe convexity results in deficits in concentration, orientation, abstracting ability, judgment, and problem-solving ability. Other frontal lobe deficits include loss of initiative, inappropriate behavior, release of sucking and grasping reflexes, gait apraxia, and sphincteric incontinence. Destruction of the orbital (frontal) lobe results in inappropriate social behavior (e.g., use of obscene language, urinating in public). Perseveration is associated with frontal lobe lesions. 2. The superior parietal lobule (Brodmann's areas 5 and 7). Destruction results in contralateral astereognosis and sensory neglect. Figure 23-3. 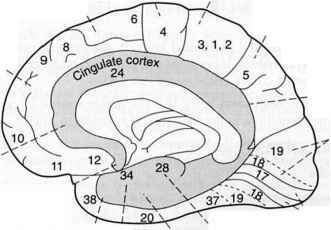 Cortical areas of the dominant hemisphere that play an important role in language production. The visual image of a word is projected from the visual cortex (Brodmann's area 17) to the visual association cortices (Brodmann's areas 18 and 19) and then to the angular gyrus (Brodmann's area 39). Further processing occurs in Wernicke's speech area (Brodmann's area 22), where the auditory form of the word is recalled. Through the arcuate fasciculus, this information reaches Broca's speech area (Brodmann's areas 44 and 45), where motor speech programs control the vocalization mechanisms of the precentral gyrus. Lesions of Broca's speech area, Wernicke's speech area, or the arcuate fasciculus result in dysphasia. Figure 23-4. Testing for construction apraxia. (A) The patient was asked to copy the face of a clock. (f3) The patient was asked to bisect a horizontal line. (C) The patient was asked to copy a cross. These drawings show contralateral neglect. The responsible lesion is found in the nondominant (right) parietal lobe. A left hemianopia, by itself, does not result in contralateral neglect. Figure 23-5. Focal destructive hemispheric lesions and the resulting symptoms. (A) Lateral convex surface of the dominant left hemisphere. 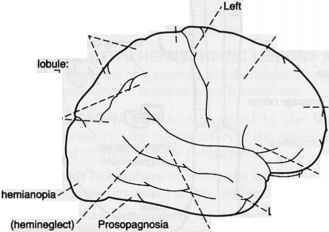 (B) Lateral convex surface of the nondominant right hemisphere. 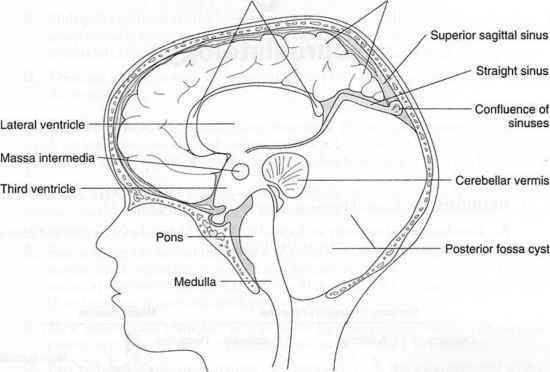 (C) Medial surface of the nondominant hemisphere. 1. 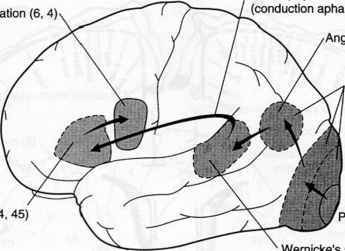 The primary auditory cortex (Brodmann's areas 41 and 42). Unilateral destruction results in slight loss of hearing. Bilateral loss results in cortical deafness. 2. Wernicke's speech area in the dominant hemisphere is found in the posterior part of the superior temporal gyrus (Brodmann's area 22). Destruction results in receptive, fluent aphasia (Wernicke's aphasia), in which the patient cannot understand any form of language. Speech is spontaneous, fluent, and rapid, but makes little sense. 3. Meyer's loop (see Chapter 17 II F 2) consists of the visual radiations that project to the inferior bank of the calcarine sulcus. Interruption causes contralateral upper quadrantanopia ("pie in the sky"). 4. Olfactory bulb, tract, and primary cortex (Brodmann's area 34). Destruction results in ipsilateral anosmia. An irritative lesion (psychomotor epilepsy) of the uncus results in olfactory and gustatory hallucinations. a. Olfactory groove meningiomas compress the olfactory tract and bulb resulting in anosmia. See Foster Kennedy syndrome Chapter 13 I C.
b. Esthesioneuroblastomas (olfactory neuroblastomas) arise from bipolar sensory cells of the olfactory mucosa; they can extend through the cribriform plate into the anterior cranial fossa. Presenting symptoms are similar to Foster Kennedy syndrome. 5. Hippocampal cortex (archicortex). Bilateral lesions result in the inability to consolidate short-term memory into long-term memory. Earlier memories are retrievable. 6. The anterior temporal lobe, including the amygdaloid nucleus. Bilateral damage results in Klüver-Bucy syndrome, which consists of psychic blindness (visual agnosia), hyperphagia, docility, and hypersexuality. 7. 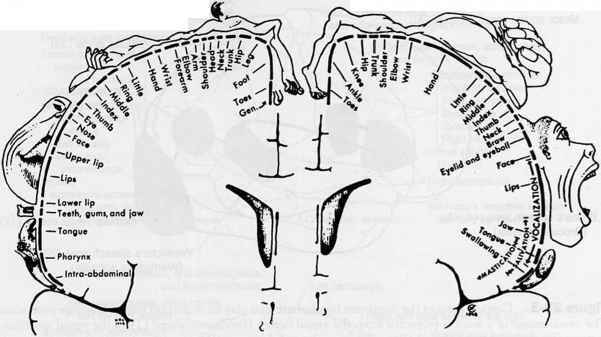 Inferomedial occipitotemporal cortex. Bilateral lesions result in the inability to recognize once-familiar faces (prosopagnosia). D. Occipital lobe. 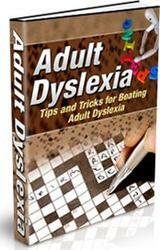 Bilateral lesions cause cortical blindness. Unilateral lesions cause contralateral hemianopia or quadrantanopia. IV. FOCAL DESTRUCTIVE HEMISPHERIC LESIONS AND SYMPTOMS. Figure 23-5A shows the symptoms of lesions in the dominant hemisphere. Figure 23-5B shows the symptoms of lesions in the nondominant hemisphere. V. CEREBRAL DOMINANCE is determined by the Wada test. Sodium amobarbital (Amytal) is injected into the carotid artery. If the patient becomes aphasic. the anesthetic was administered to the dominant hemisphere. A. The dominant hemisphere is usually the left hemisphere. It is responsible for propo-sitional language (grammar, syntax, and semantics), speech, and calculation. B. The nondominant hemisphere is usually the right hemisphere. It is responsible for three-dimensional, or spatial, perception and nonverbal ideation. It also allows superior recognition of faces. Figure 23-7. Chimeric (hybrid) figure of a face used to examine the hemispheric function of com-missurotomized patients. The patient is instructed to fixate on the dot and is asked to describe what he sees. If he says that he sees the face of a man, then the left hemisphere predominates in vocal tasks. If he is asked to point to the face and he points to the woman, then the right hemisphere predominates in pointing tasks. VI. SPLIT-BRAIN SYNDROME (Figure 23-6) is a disconnection syndrome that results from transection of the corpus callosum. A. The dominant hemisphere is better at vocal naming. B. 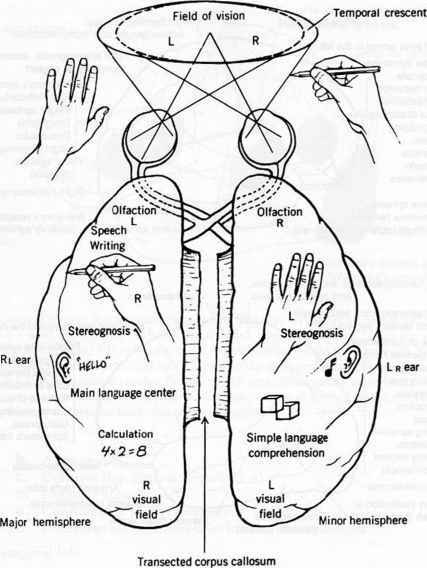 The nondominant, mute hemisphere is better at pointing to a stimulus. A person cannot name objects that are presented to the nondominant visual cortex. A blindfolded person cannot name objects that are presented to the nondominant sensory cortex through touch. C. Test (Figure 23-7). A subject views a composite picture of two half-faces (i.e., a chimeric, or hybrid, figure). 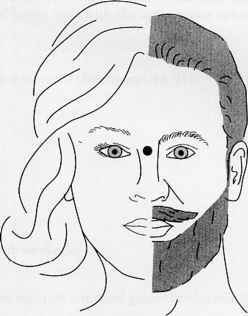 The right side shows a man; the left side shows a woman. The picture is removed, and the subject is asked to describe what he saw. He may respond that he saw a man, but when asked to point to what he saw, he points to the woman. D. In a patient who has alexia in the left visual field, the verbal symbols seen in the right visual cortex have no access to the language centers of the left hemisphere. A. Anterior corpus callosum lesion may result in akinetic mutism or tactile anomia. B. Posterior corpus callosum (splenium) lesion may result in alexia without agraphia. C. Callosotomy has been successfully used to treat "drop attacks" (colloid cyst of third ventricle).